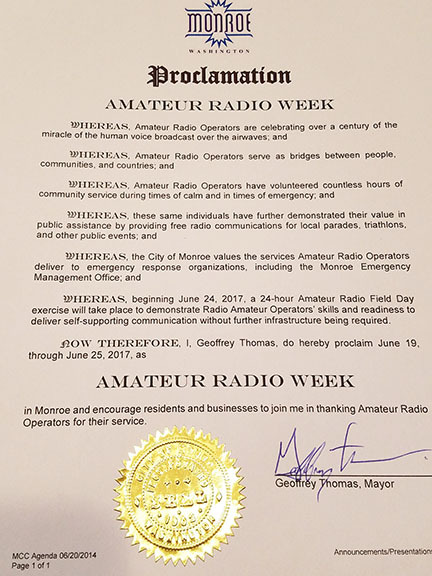 2017 Proclamation from the State Of Washington and presented by the City of Monroe proclaiming June 19-25th as Amateur Radio Week. 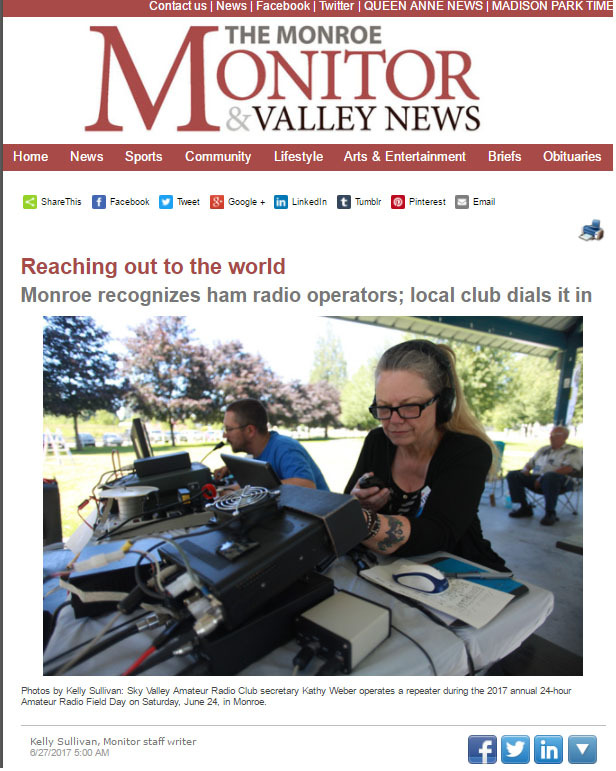 The city of Monroe recognized the Sky Valley’s ham radio operators for their efforts in service and volunteerism. 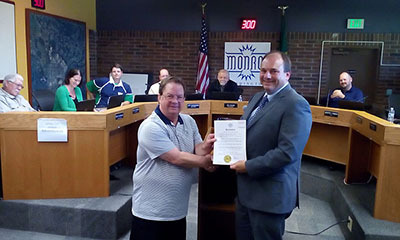 Mayor Geoffrey Thomas proclaimed this June 19-25 Amateur Radio Week during last Tuesday’s council meeting. 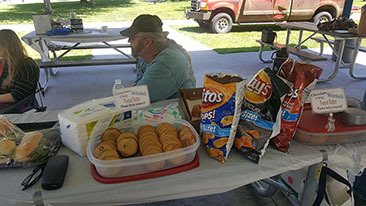 He noted the community has given “countless hours” back “during times of calm and times of emergency” by providing communications for public events, such as parades and triathlons. 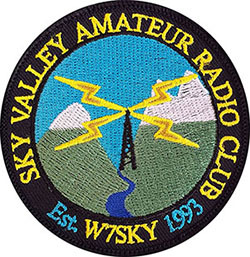 Sky Valley Amateur Radio Club president David Harvey accepted the decree. 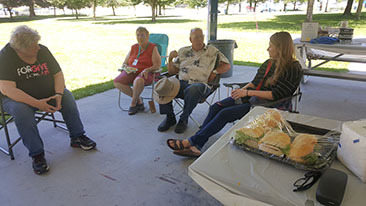 The retired Sultan School District educator has honed the skill for more than four decades, and joined the local group when he moved to the area. Harvey said he works the airwaves allocated to amateurs on a daily basis now that he has the time. 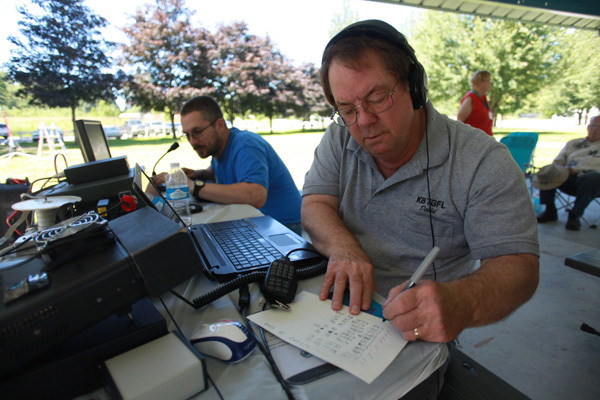 His specialty is in sending long-distance calls, or DXing, which he refers to as one of the “venues” on ham radio. Others include short-distance communication, using morse code, bouncing signals off the moon and working with satellites, Harvey said. 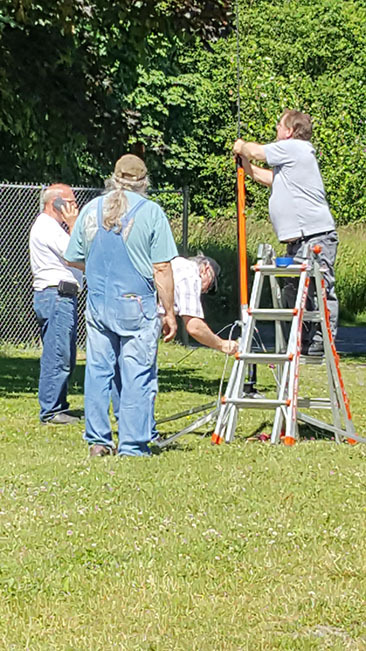 Some groups will participate in what is called “mountain topping.” They hike up to a peak and beam their signals off a far away mountain range, he said. 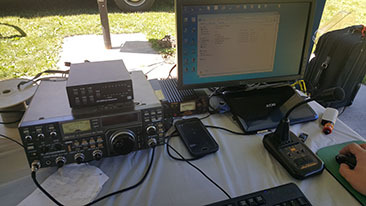 Two reasons — among the many — people involve themselves in amateur radio is for the social aspect and emergency preparedness. Harvey said for himself especially it has been the camaraderie. 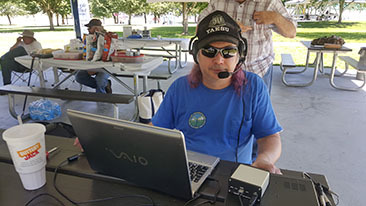 He has had the chance to speak with other amateurs over the radio in Hawaii and Alaska, as well as pilots and people on private sea vessels. So far he has made contacts in 156 — almost half — of the world’s countries. The discussions last a few minutes and are usually along the same theme, Harvey said. 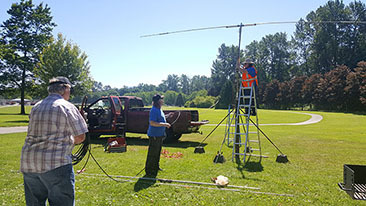 “Conversations are almost always about what gear and antennae we are using,” he said. Operating on the amateur airwaves requires obtaining a license from the FCC. 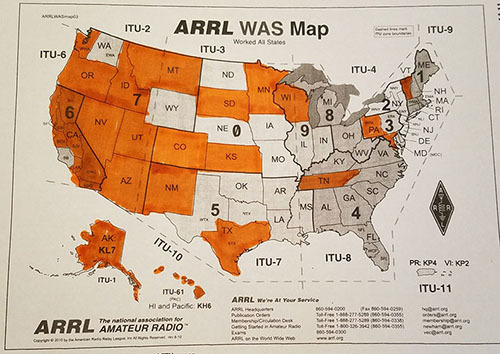 There are 26 different bands that ham radio operators can access, according to the National Association for Amateur Radio. Others are only allowed for government, commercial and military use. 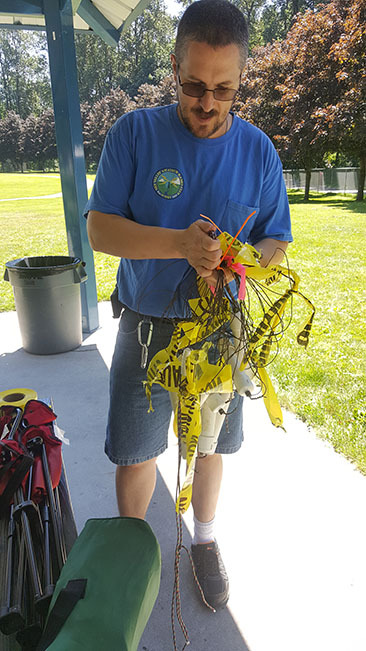 Harvey said it is important to make use of the bands legally. Taking the test, and knowing how to run their devices properly, ensures there won’t be harmful interference to other services. 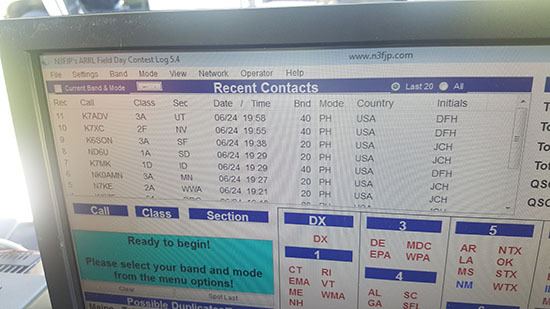 Operators receive their own, individual call signs after they pass. Making contacts and making them the right way takes skill. 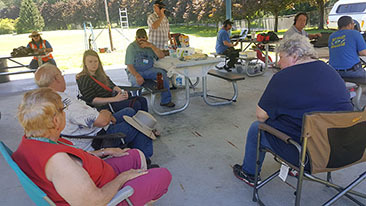 Sunspots run on an 11-year cycle, and are at their lowest point right now, said Sky Valley Amateur Radio Club member Bruce Weber. This can make certain frequencies of amateur communications a challenge, he said. 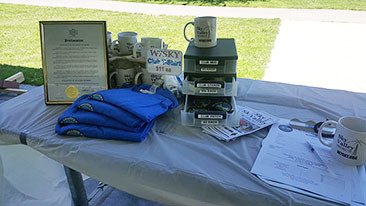 Club secretary and webmaster Kathy Weber has been involved in the hobby for about seven years. She shares the interest with her husband, Bruce, who introduced her when they first met in 2003. She said she and her husband once spoke with a man from Russia while at the ocean. It felt “like he was sitting right next to us,” she said. Bruce Weber became a ham operator in the 10th grade back in 1967, following after his father. He said when he passed the novice test he could complete five words per minute in morse code. 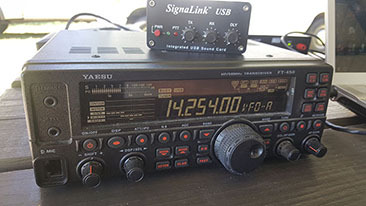 One of Bruce Weber’s more exciting moments throughout his many years as an operator was meeting now-retired late-night amateur radio talk show host Art Bell. 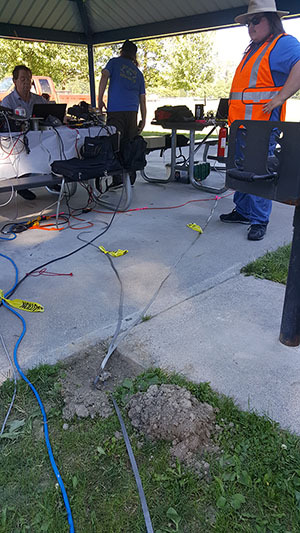 He happened to be working for a company that repairs repeaters, which are devices used to receive and transmit signals, and Bell was in need of assistance. Bruce Weber is also involved in the emergency preparedness side of the practice. 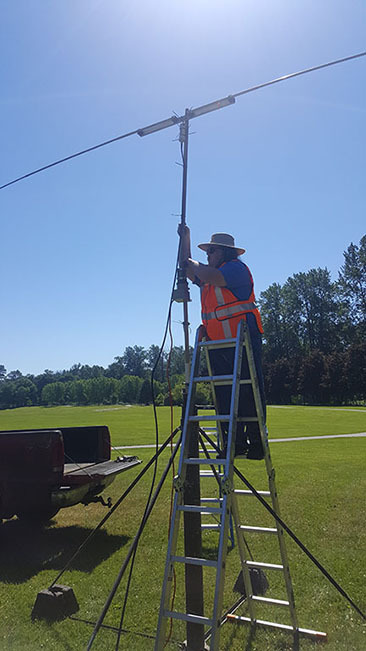 He is a member of the Snohomish County Auxiliary Communications Service, which works with amateur radio operators and agencies countywide to establish connections before a disaster occurs. 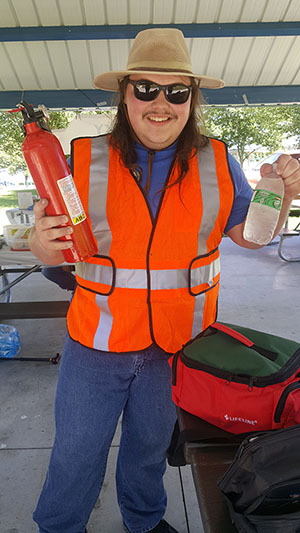 Part of the participation includes weekly tests to make sure the lines remain open, he said. 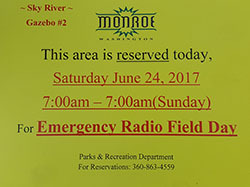 Harvey said another common application is the use of amateur radio waves at local events, such as last weekend’s TriMonroe triathlon, which ran the same time as the annual 24-hour Amateur Radio Field Day for emergency preparedness. 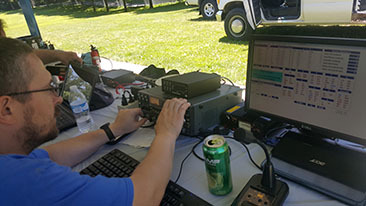 Amateur radio can provide easy ways for volunteers to communicate over a short distance, and ensure the event is running smoothly, he said. 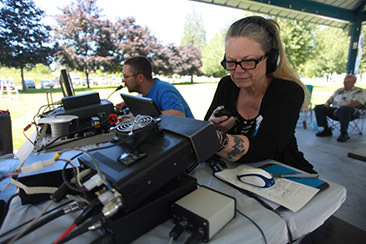 “Amateur Radio Operators are celebrating over a century of the miracle of the human voice broadcast over the airwaves,” Thomas said, citing the proclamation document. 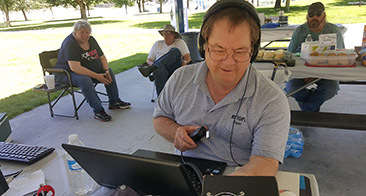 Sky Valley Amateur Radio Club president David Harvey operates a repeater during the 2017 annual 24-hour Amateur Radio Field Day.